The ACS71020 power monitoring IC greatly simplifies the addition of power monitoring to any AC/DC powered device. By making use of Allegro’s Hall-effect-based, galvanically isolated integrated current sensor technology, reinforced isolation can be achieved. The sensor can be powered from the same supply as the MCU, eliminating the need for multiple power supplies and digital isolation ICs. The isolated current measurement is done by detecting the magnetic field from the integrated conductor, eliminating the need for external sense resistors, current transformers, or Rogowski coils. Two Hall plates are used for this measurement to differentially sense the field, thus eliminating errors due to stray magnetic fields. 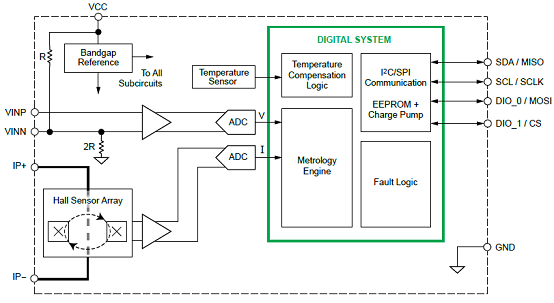 Multiple parameters like bandwidth, averaging time, and fault levels are user-programmable. The sensor features all key power measurements, which can be read out through I2C or SPI, as well as dedicated pins for voltage zero crossing (suitable for light-dimming applications) and fast overcurrent fault (for short-circuit detection). 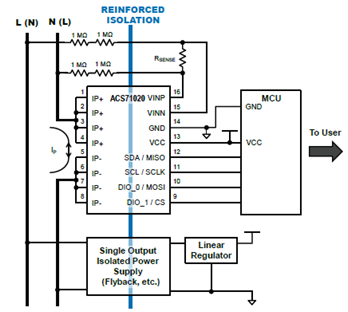 As the sensor is isolated, these pins can be easily accessed by the MCU without additional isolation to each signal. These two pins can also be configured to flag a VRMS under/overvoltage. The ACS71020 is provided in a small, low-profile, surface-mount SOIC16 wide-body package. The ACS71020 is lead (Pb) free, and is fully calibrated prior to shipment from the factory. Further customer calibration in application can improve accuracy. 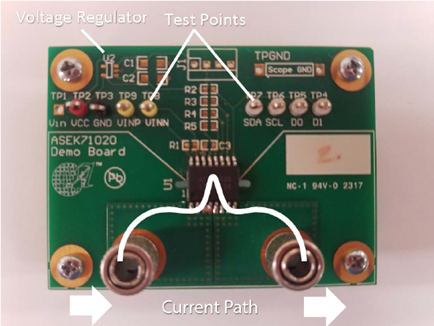 Allegro ACS71020 demo board is pictured in Figure 2 below. Refer to Table 1 for symbol names and descriptions of onboard components. Note: Board is pictured without capacitors and resistors attached.